Halloween has come and gone. It’s past the season for my coffin-shaped purse, which only gets used in late October. 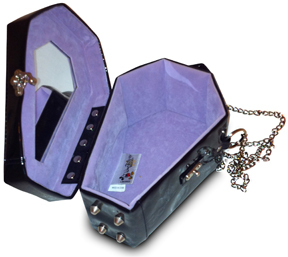 Yes, that’s right, a patent leather purse shaped like a coffin. It’s slightly marred by the logo for Disney World’s Haunted Mansion, a woman in a maid’s outfit, but I love it anyway. I have a tote bag that came from Victoria’s Secret; one of those free gifts they’re always giving away. It has laces that criss-cross up the middle to make it look like a corset. I think it’s clever. I try to use it from time to time, but whenever I dig it out of the back of the closet, I end up talking myself out of it. If I applied my sister’s rule for clothing to that bag – if something hasn’t been used in a year, get rid of it – it would have been due to go to Goodwill about five years ago. I also have a small Anne Taintor wrist bag that a friend gave me for my birthday. Anne Taintor is a designer who mixes vintage images with modern captions, and then puts them on things. My bag has a picture of an Audrey Hepburn look-alike. The caption is, ‘She saw no reason to act her age.’ That bag gets used considerably more than the coffin-shaped one, but it still doesn’t get out much. The last time I used it was when my daughter and I went on our annual pilgrimage to Fenway. It was the perfect outing for that bag. Recently, I went to the web to see what other things Anne Taintor designs. I discovered that my bag is actually meant to be used for cosmetics. Does that mean that the message, ‘She saw no reason to act her age,’ is meant to be seen only when I apply makeup? If so, it would get less use than the coffin-shaped bag. It might even have to join the corset bag in the back of the closet. Upon reflection, and in keeping with the sentiment on the bag, I’ve decided to continue to use my Anne Taintor bag as a wrist purse. The corset bag, however, will remain in the closet, at least until my next trip to Goodwill. Great topic, Judy! I have a delicate evening bag that my flapper grandmother used when she accompanied a rich aunt on her move to Paris — which ended with the aunt’s sudden death, but that’s another story. Why do we keep these bags? They represent stories we hold onto. Old love. Old dreams. Old fun had or never had. Would make an interesting survey. What’s buried in your closet— and WHY? What a wonderfully odd bird you are…now fly, dearie. I LOVE handbags. Love them. That coffin one is way too cool. While I worry about my hairstyles or clothing looking too young, so I shy away from certain trends, I haven’t run into that with handbags yet. Ann Taintor items are fun. Use it as a bag. You can probably get that same sentence on a number of Taintor products. What fun is it to act exactly my age when I don’t feel all that differently than I did 10-15 years ago?